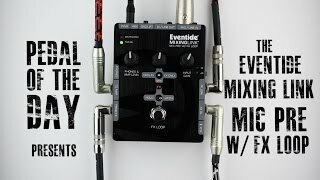 Eventide announced a new studio-quality microphone preamp in a compact stompbox form factor with an effects loop. The MixingLink™ fits neatly on a pedalboard or in a backpack, allowing vocalists immediate control over effects. Our pedals were designed for guitar but most of the effects really work well for voice. The Mixing Link makes it rather easy for singers to connect to most guitar stompboxes and, with its high quality mic pre, it’s at home both on stage and in the studio,” said Tony Agnello of Eventide and Manifold Labs.